serves Liturgy in Beltsville, MD. Last August the Fund for Assistance received a heart-wrenching letter from a ROCOR missionary priest on Bukasa Island, Uganda. “I have almost come to the end of the wall. I sometimes can’t afford to buy the church wine. This means I have to miss the Holy liturgy… I trust in my Lord for everything," wrote Fr. Christopher Walusimbi in an email. Fr. 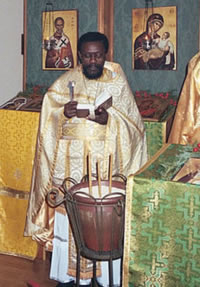 Christopher is the first Black African priest ordained in ROCOR and is under the omophorion of Metropolitan Hilarion. Bukasa Island is considered one of the world’s beautiful places, it overlooks Lake Victoria, and is a popular though remote tourist destination for forests, exotic birds and monkeys. Second largest of the 84 islands in the Sessee archipelago, it is remote and dangerous to get to. Life here is difficult. Poverty is rampant, there is no healthcare and no electricity. Most people survive by growing and selling produce. And here, in the midst of Africa, on a tiny island you will not find on most world maps, stands a beautiful Russian Orthodox Church with multi-colored Russian style cupola built by Fr. Christopher Walusimbi, who is not only the priest, but also a representative to the District educational Committee, a Board member at two other school committees; he is also considered somewhat of an elder in the community and is a popular person to consult with in any family crisis. miles to get fresh water. Despite being over 60 years old, Fr. Christopher is very active: he assumed a great burden to help children in the Sesse islands, who were orphaned as a result of the AIDs epidemic. For the past 25 years he has also run an ambulance service form the island to the mainland 40 miles to the north. Besides serving every Saturday and Sunday, hearing confession whenever any of his parishioners need it, and taking care of his parish and other duties, Fr. Christopher has to take care of his own large family, he has a wife and ten children. “We grow our own food, take what is needed, and sell the rest in shops. My wife makes the best cookies, which we sell on the mainland in supermarkets,” he wrote in an email. The family survives on their own produce and donations from people who know his difficult situation. Even though the parish comprising over 100 parishioners has never yet been able to pay him a salary, Fr. Christopher feels responsible for their financial as well as spiritual well-being. He continually looks for ways to help the mission’s financial situation. Because in his thinking, when the mission gains strength, so will the members. Shacks in Lake Victoria, Uganda. Recently the community started planting orange trees with plans to sell juice and wine in order to sustain the mission. They already have 100 seedlings, and are looking for a way to acquire 500 more. They also raise chickens and make charcoal to take to the mainland for sale. Getting there, however, is no easy feat. Located over 40 miles south of Kampala, the only way Fr. Christopher can get to mainland where banks, post offices, email access, super markets, fuel, good schools and hospitals are located is taking a 4 to 6 hour dangerous boat ride. Every year over 100 people die in boat accidents on Lake Victoria. Every trip costs the parish $126 (24 gallons of gas and 12 gallons of oil). The mission has to take around four trips a month, which comes to $504. Unfortunately, the parish boat and engine are old and are dangerous to use. A new engine will cost $3,000 which the mission doesn’t have. Despite many difficulties, the parish continues to grow. Sometimes whole families convert, sometimes individuals. All of them need help. Although there are many needs, Fr. Christopher considers education as the most urgent, as it allows people to understand their faith. Contrary to most of the Ugandan population who think that women do not need education, Fr. Christopher believes that it is especially important to educate girls. “We need to collectively fight this way of thinking if we are to expect developed society”. In 2009 FFA raised over $22,000 to the Uganda mission. “I feel so blessed that we have God’s people coming for us at all times, I thank everybody for all the love not only to us sinners but to our Holy faith,” wrote Fr. Christopher. We ask you to support Fr. Christopher Walusimbi and the ROCOR mission in Uganda! Please make the check out to the Fund for Assistance to ROCOR/Uganda and be sure to include your return address so we can send you a receipt for your records. Give the gift of Orthodoxy to a person in need of guidance!